Daifuku or Daifuku Mochi, is a type of wagashi, or Japanese sweet. It's a popular Japanese snack usually served with green tea. 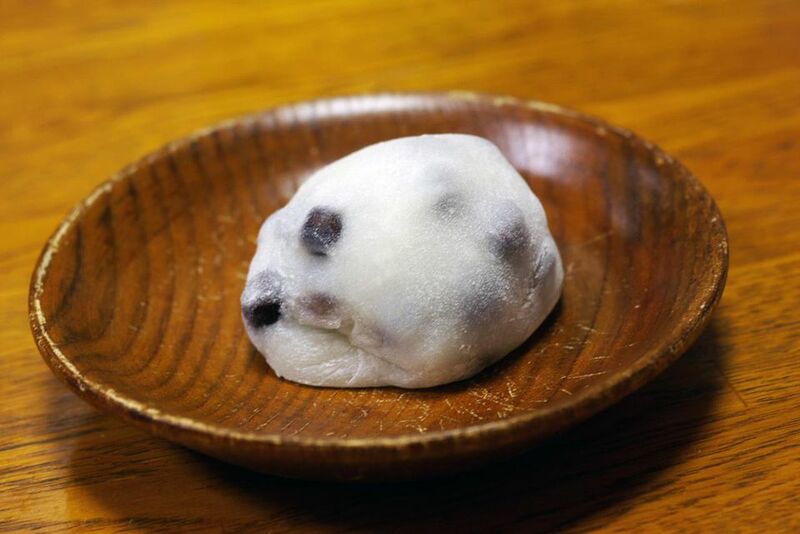 Daifuku is most commonly filled with red bean paste, but some are filled with white bean paste (Shiroan). There are also mochi which is colored and flavored with kinako (soy bean flour), yomogi (Japanese mugwort), matcha green tea powder or a touch of red food coloring. It takes quite a bit of time to make mochi from scratch. You can also make mochi with shiratamako or mochiko (glutinous rice/sweet rice flour). The flour is mixed with water and steamed either on the stovetop or in the microwave. With this quick method, sticky tasty mochi is ready in no time. Note: while there are multiple steps to this recipe, this mochi is broken down into workable categories to help you better plan for preparation and cooking. Heat 2/3 cup of water and 1/2 cup of sugar in a small pot. Add 1/4 cup of anko powder and stir well. Make 12 small anko balls and set aside. Put shiratama-ko in a heat-resistant bowl. Mix water and sugar in a separate small small bowl. Gradually pour the water-sugar mixture into shiratama-ko, stirring well. Put the bowl in microwave and heat the dough for about 2 minutes. Heat the dough in the microwave again, until the dough inflates. Dust a flat pan, as well as your hands, with some katakuri-ko starch. Remove the hot mochi from the bowl to the pan by hand. The mochi will be hot and sticky, so please be careful not to burn your hands. Dust hands with more katakuri-ko starch and divide the mochi into 12 pieces by hands. Make 12 flat and round mochi pieces. Put a piece of the anko filling in the center of the mochi and wrap the anko by stretching mochi. Repeat the process to make more pieces.